To take on Apple and HTC in high-end smartphone market, Samsung has launched all new Samsung Galaxy Note 5 in Indian market priced at Rs 53,900 for the 32GB and Rs 59,900 for the 64GB in Black Sapphire, Gold Platinum, Silver Titan, White Pearl colour option. While it’s predecessor Samsung Galaxy Note 4 is available from 17th Oct. 2014 in Charcoal Black, Frost White, Blossom Pink and Bronze Gold colour option. It will take on Apple iPhone 6, iPhone 6 Plus, Sony Xperia Z5 and HTC One(M9). The all new Samsung Galaxy Note 5 supports Nano SIM, 4G LTE, NFC offers you bigger a 5.7-inch Super AMOLED display with 4k (2160×3840)Resolution, ~518 ppi pixel density with Corning Gorilla Glass 4 runs on latest Android 5.1 Lollipo OS and powered by 64-Bit Samsung Exynos octa core (2.1GHz Quad + 1.5GHz Quad) with 4GB RAM, 32GB/64GB internal memory(no MicroSD card slot) promising you dream multi-tasking experience. For shooting Samsung Galaxy Note 5 sporting a huge 16MP primary camera with+ Smart OIS/ Fast AF, Live HDR(Rich Tone) and 8-MP front camera powered by a 3000mAh battery with fast charging and ultra power saving mode promising longer battery life offers you innovative next generation features like Advance S Pen stylus technology, fingerprint sensor, Smart Select, Photo Note, Multi Window, new Easy Clip, Direct Pen Input, Air Command, S Voice™ Hands Free, S Health measures 153.2 x 76.1 x 7.6 mm and weight 171gm. 3000 mAh battery with fast charging and Ultra Power Saving mode. 3000mAh battery with fast charging and Ultra Power Saving mode. 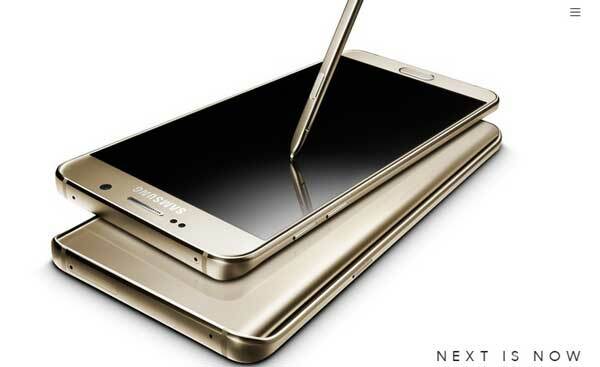 At last few honest word that new Samsung Galaxy Note 5 is the best gadget to revolutionize your multi-tasking . What you think? Please be open to give your view.